Bretton Woods in NH is popular spot for riders and skier in the state of New Hampshire. Whether visitors prefer discovering secret powder stashes or making the perfect turn on open cruisers, exploring miles of tree-dotted glades, the three peaks of Bretton Woods provide opportunities for beginners to the most advanced riders and skiers. With wide mountain vistas, romantic sleigh rides, 100 kilometers of Nordic trails, thrilling canopy tours above snow-topped trees, and much more, there are amazing experiences for everyone at Bretton Woods. Bretton Woods is the largest alpine ski area in New Hampshire with 464 acres of snowboarding and skiing on thirty-five glades and sixty-two trails, as well as three terrain parks. On the grounds of the White Mountain National Forest and the historic Mountain Washington Hotel is the Bretton Woods Nordic Center, one the eastern United States' largest cross-country areas. The one hundred-kilometer trail network ventures across open fields, passes mountain streams and beaver ponds, winds through fir and spruce woods, and journeys across open hardwood stands. The Canopy Tour at Bretton Woods provides a three-hour experience for both thrill-seekers and nature-lovers. The series of tree-top zip lines, situated high on Bretton Woods' slopes, descends more than 1,000 feet through a platform network through the ancient hemlocks. When there's snow on the ground, a sleigh ride is the perfect way to explore the trails of Bretton Woods. Visitors can sit back and relax in the comfort of a horse-drawn sleigh as they tour the grounds, just how guests have done for centuries. Sleigh rides allow visitors to experience a different kind of horsepower, and take in the beauty of the scenery as the sled runners glide over the snow. The Tubing Hill at Bretton Woods offers more thrilling fun for visitors of all ages as they soar down the sculpted tubing run. The packed powder on the run, which is made for speed, will give guests a rush that will make them want to hit the hill one run after another. Guests will laugh and scream as they slide, glide, and spin down the fun tubing runs. Visitors can take a ride down the hill solo, or take a tandem ride with another person, which offers even greater speed. 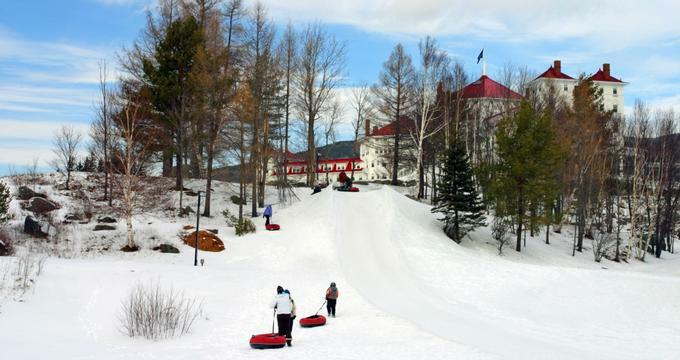 The Mount Washington Resort at Bretton Woods offers snowshoeing opportunities for visitors as well. Guest can explore the grounds' snow-covered trails of the spectacular resort, as well as the White Mountain National Forest, from a perspective that only snowshoes can provide. Visitors of all fitness level and ages can enjoy snowshoeing with almost no learning curve. The sport provides an excellent way to get some exercise and explore the outdoors, from an easy stroll to a more challenging backcountry hike. Snowshoeing participants can trek the high-country trails along the Bretton Woods Mountain Resort's ridgeline, walk the meandering trails along the Ammonoosuc River, or view the stunning vistas of the Presidential Mountain Range.